When Yarmouth-Dennis needed a clutch hit in the playoffs, Ryan Rohlinger always seemed to be there to deliver. And when the Red Sox needed a lights-out performance on the mound, Josh Faiola didn’t let them down. Rohlinger, a shortstop from Oklahoma, had three hits, including a two-run double, in Y-D’s 9-1 victory over Brewster in the first game of the East Division series. In the first game of the league championship series, when he found himself hitting fourth in the Red Sox lineup, the first time he’d hit in that position all season, he didn’t disappoint. He hit a run-scoring double in the first inning, and he blasted a solo home run – his first of the season – for the game-winning run in the bottom of the eighth. Despite that display of power, though, he took on the sacrificial role when he was needed. 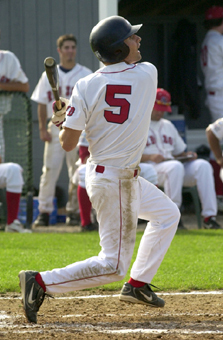 In the 11th inning of the second game against Falmouth, he laid down a perfect squeeze bunt to extend the Red Sox’s lead to two runs, and they went on to win. Rohlinger hit .429 in the postseason with three runs scored and five RBI. A team can’t win a championship without pitching, though, and Faiola (Dartmouth) came though every time Coach Scott Pickler called his name. 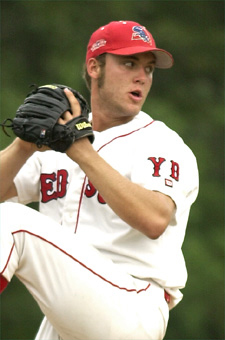 He earned saves in the second game of the East Division series, the game that sent the Red Sox to the league championship series, and he earned another save in the first game against Falmouth. He shone brightest, though, in Y-D’s series-clinching win. He threw two scoreless innings of relief, blanking the Commodores in the bottom of the ninth and working his way out of a jam in the next inning, stranding runners at second and third. When the Red Sox exploded for four runs in the top of the 11th, Faiola received the win. These two players were the first dual winners of the Sportsticker Boston Playoff MVP Award since Matt Cepicky and Ryan Earey of Chatham shared the award in 1998. They are the first Y-D players to win Playoff MVP since Kirk Piskor in 1990. This is the fifth time in the awards 20 year existence that two players have shared the award. The first duo were Mo Vaughn and John Thoden for Wareham in 1988.